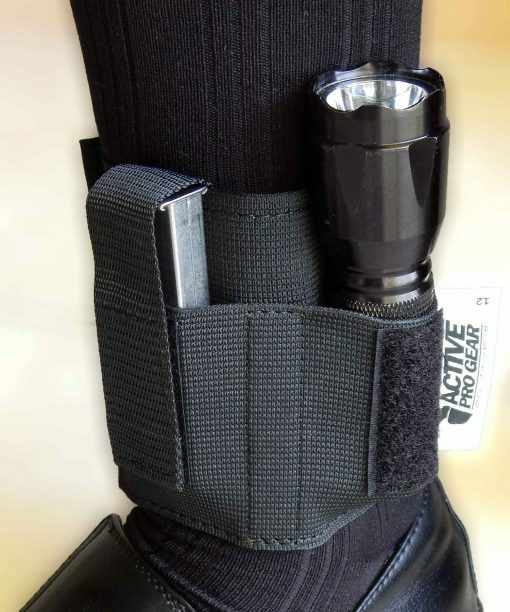 Carry two backup pistol magazines comfortably around your ankle for fast access completely concealed. 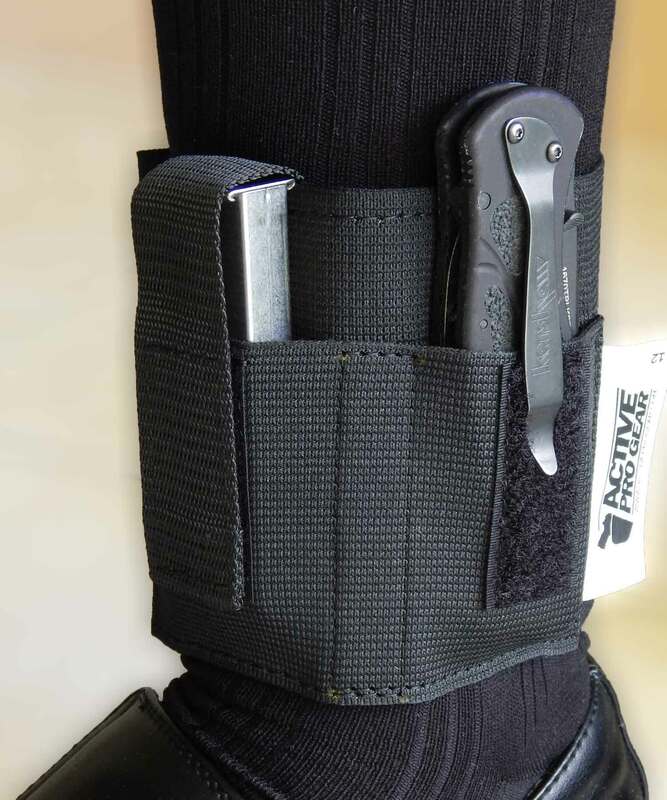 The Ankle Holster Magazine Carrier has two pouches and includes adjustable retention straps for security and to accommodate different sized magazines. Can also conceal carry pocket knives, flashlights, cash, or multi-tools. Made from premium USA-Made breathable elastic, heavy-duty nylon webbing and Velcro for extreme concealment and comfort. Unlike bulky, sweaty neoprene, this special lightweight, long-lasting elastic has a unique plush finish on one side so it feels like velvet on your skin for a comfortable, all-day carry. You’ll forget you’re carrying! FITS: Fits most single or double stack magazines. IMMEDIATE ACCESS: You have immediate access to your gun magazines or items. 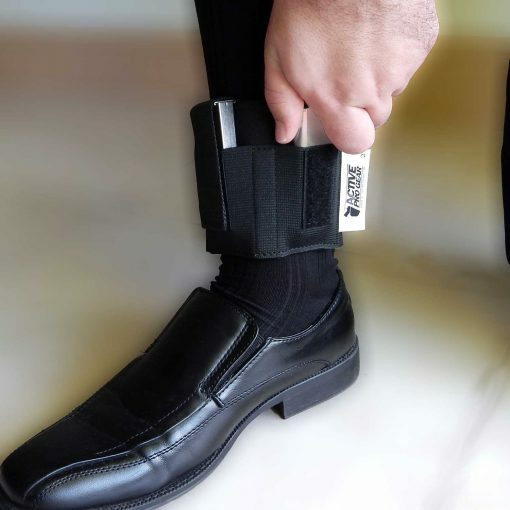 If you’re not more than delighted with the Ankle Holster Magazine Carrier’s quality construction, unsurpassed versatility and comfort, just return it at any time within 1-Year of purchase for a full refund. The Velcro rips the hemming out of my suit pants (three so far). Any suggestions for preventing this? I’ve never experienced that, but I would recommend getting a little piece of velcro to cover the part that is grabbing your pant hems. How well does it accommodate pocket knives? I know it says it is possible on the product description, but any personal feedback would be appreciated. It actually works really well. I mean it depends on your pocket knife, but any that I have used in there have stayed in place. Structurally it should be able to store a knife. Much depends on the dimensions of the knife. I would think it would be a less than ideal means of carry. A lot of lateral movement when walking/running. As long as it’s not a really huge knife you should be just fine. How does it feel on the lower leg, is it comfortable, how well does it work with sweat? I live in south Louisiana so sweating is imminent. I’ve tried quite a few different ankle pouches, this is the most secure and the most comfortable I own. It fits perfectly wherever I place it, and it doesn’t slip down like the neoprene tends to do. I also sweat profusely and it’s been going good for over a year with little sign of wear and tear on it. They are pretty comfortable and I didn’t have any problem with sweat. That said, you will have trouble running carrying high cap mags on your ankle. Should have some type of support like an ankle holster. I live in California with dry heat so sweat is not a problem here. However, I wear it over white socks under jeans and it is so comfortable, I do not even know it’s there. So, no problems. I carry a Kimber 3″ .45 auto on the other ankle with the same result. Good luck! I wear thick athletic socks under the holster, and it’s not bad at all. I live in TN. Would this fit double stack Glock mags? I was able to accommodate two Glock 21 mags, which is the double stack 45acp. The Velcro straps barely fit over, but it is doable. Sorry, the double stacks are much too wide for this rig. G26 and G27 mags fit fine (factory base plates; pinky extensions might be a stretch). 5.0 out of 5 stars P.S. Good to dang go! Love it! 5.0 out of 5 stars A.C. Five Stars. Comfortable fit. Daily carry. 5.0 out of 5 stars A.C. Five Stars. Great, no problems. 4.0 out of 5 stars A.C. Wears well ... This product works as advertised. 5.0 out of 5 stars B.S. Five Stars. It was just what I was looking for. 5.0 out of 5 stars J.N. Just what I was looking for. Felt great...worked great for my SW .380 Bodyguard clips. 5.0 out of 5 stars W.C.G. Excellent. Fits perfectly, seems well made and durable. 5.0 out of 5 stars A.C. Great Backup. I wear it daily - best for lightweight mags as there is no calf support strap.It has adjustable straps its comfortable holds small Sig 238 and med 229 magazines also. 5.0 out of 5 stars K.C. Economic and works out great. I like my ankle magazine carrier, exactly what I wanted, it fits well and it does what I want it to do. 4.0 out of 5 stars D.A. Fits well above my 8" boots. Material feels durable but will likely chaffe a bit at the edges after a 11-12 hour shift due to it being mainly nylon. Velcro straps adjustable to accomodate mny mag sizes though I doubt double stack mags would fit well. 5.0 out of 5 stars M.J. Good for Folders. Comfortable and very nice for folding knives as well. A knife that folds to 4.5 inches or less should work fine. A little larger might work also but did not try. 5.0 out of 5 stars A.C.B. Just what the gun doctor ordered Just what I needed to carry 2 mags. 5.0 out of 5 stars J.K. Best ankle mag carrier out there! This is definitely the mag carrier you want to buy. I made the mistake of buying the DeSantis brand ankle carrier first. S I was able to compare it With active Pro gear . This carrier has a much more slim design heavy-duty Elastic band with heavy duty Velcro and more concealable then the desantis.And with this company you get a money back guarantee DeSantis wanted to charge me 15% restocking fee and pay my own shipping for return that was an improper fit to begin with. Its comfortable and fits my Glock 43 mags perfectly and securely. 5.0 out of 5 stars R.G. Five Stars. Works great. 5.0 out of 5 stars F.M. Five Stars. Fits M&P shields mags perfect. Glock double stack mags are a bit to big for this. 5.0 out of 5 stars D.R. This Two magazine holster is very comfortable. It will only hold single stack. This two magazine holster is very comfortable. It will only hold single stack, small magazines. A small flashlight and a knife (my leatherman fits great) are also possible. I give it five stars because I needed it for a mag and my leatherman. 5.0 out of 5 stars R.N. Five Stars. Very usefull good job!!! 5.0 out of 5 stars B.B. Just what I wanted. I ordered this ankle carrier to hold my box cutter and flashlight while at work. This does the job perfectly! It arrived on time, and works exactly as I expected. I've gotten to where I don't even notice it most of the time while I'm wearing it. 5.0 out of 5 stars P.T. Great deep concealment solution for extra mags. I have a Kel-Tec PF-9 (7 rounds, single stack, 9mm) and the mags fit perfectly in this. I either wear it as shown, but under my sock, or upside-down above my calf. Certainly not the easiest to get to, but if concealment is the priority (white-collar office situations), it's a great option. (Dec. 2013 update) I just changed my daily carry to a Sig Sauer P938, no problem with the mags (6 or 7 round) for that gun either. Also survived Sig Academy's new "Ankle Holster Operator" class (great class) and learned exactly how slow it is to pull mags from here... From a tactical perspective you might still want a mag in your pocket, or really train to start accessing that next mag far before you need it. Still like the product, just another new skill to develop. 4.0 out of 5 stars S.H. Works wells, for smaller mags only. This is a good product and seems quite well-made. The stitching is firm and after a couple of weeks of almost daily wear, shows no sign of fraying or loose threads. The velcro is tight and holds securely. Ankle and calf type will definitely determine comfort. I have fairly large calves with thin ankles (cyclist) so it usually requires a readjust once or twice throughout the day for maximum comfort. However, I never feel as if it is sliding or shifting, even when going up and down stairs or doing a lot of walking. Like everything else, it takes a little getting used to. The magazine pouches are very secure and there is no concern of a magazine falling out. These are made for small single stack magazines. I have carried a double stack .45 magazine in it once, but it didn't feel secure and was at the very limits of the velcro retention straps. It holds two magazines for a Ruger LC9 quite nicely. Even the magazines with the pinky extension fit well. This is a great option for carrying extra magazines discreetly. 5.0 out of 5 stars N.J.W. Love it. It holds my extra mags and keeps my bulky pocket knife hidden away too. All in a comfortable spot that I don't have to worry about and stay hidden. It holds really well too. 3.0 out of 5 stars R.S. A bit uncomfortable at times. It works as described, but I gave it 3 stars because it is a bit uncomfortable at times. There is no padding so the material they use has a tendency to bite into your ankle unless you have it secured just right. Other than that, it is well made and seems like it will last. 3.0 out of 5 stars D.D. It holds the compact 40 10 round magazines well (15 round not so much) and it's comfortable. My only gripe is there is no moisture barrier. If you wear it for any length of time your magazines will be covered with sweat. 3.0 out of 5 stars K.O. Not great but it works. It gets hot after a while wearing it. This is a good product and seems quite well-made. The stitching is firm and after a couple of weeks of almost daily wear, shows no sign of fraying or loose threads. The velcro is tight and holds securely. Ankle and calf type will definitely determine comfort. I have fairly large calves with thin ankles (cyclist) so it usually requires a readjust once or twice throughout the day for maximum comfort. However, I never feel as if it is sliding or shifting, even when going up and down stairs or doing a lot of walking. Like everything else, it takes a little getting used to. The magazine pouches are very secure and there is no concern of a magazine falling out. These are made for small single stack magazines. I have carried a double stack .45 magazine in it once, but it didn’t feel secure and was at the very limits of the velcro retention straps. It holds two magazines for a Ruger LC9 quite nicely. Even the magazines with the pinky extension fit well. 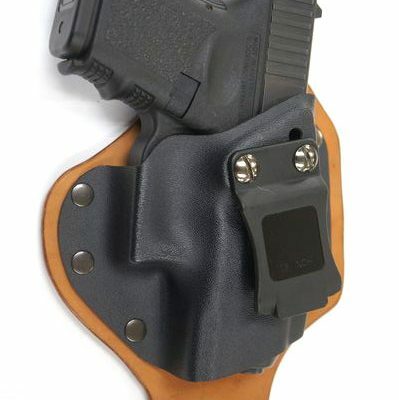 This is a great option for carrying extra magazines discreetly. Bought this as a gift for young lady wanting to keep a spare mag hidden inside her boots. She says it works perfectly… I will likely get 1 for myself as well. Really like how thin and comfortable this is to wear. Would have liked the slots to be a little deeper, but overall I would buy again. 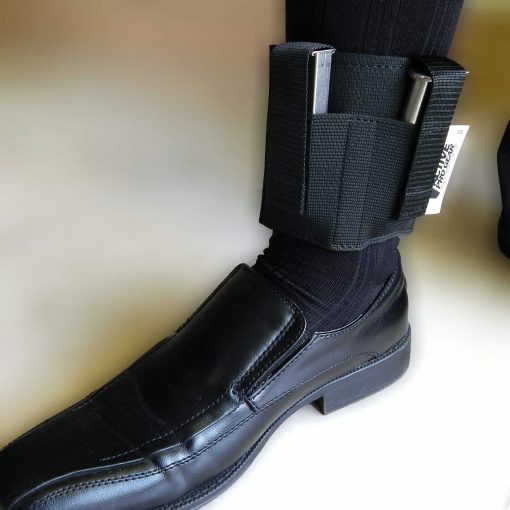 I purchased the ankle holster and the magazine carrier, both with calf strap for support. They are very comfortable to wear all day. Carrying the pistol on one leg and extra magazines on the other lends some balance to the setup. 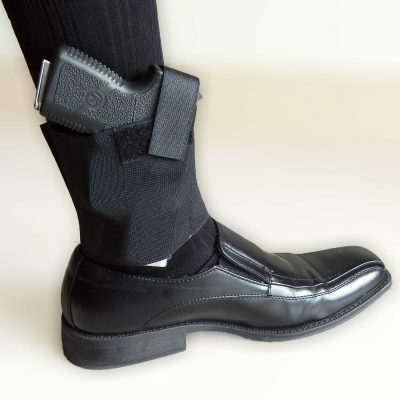 I have experienced slipping of the holster when I walk fast – perhaps I had the calf strap insufficiently tight.